CONSOLATION TRY . . . Davy Graham scored a late consolation on a disappointing day for City of Derry in Seapoint. City Derry travelled to Kilbogget Park in south Dublin looking to give themselves some breathing space in the AIL Division 2C but returned north deep in the relegation dogfight. Prior to kick off, Derry sat five points ahead Saturday’s opponents, Seapoint, who sat second bottom in ninth with three games remaining. Having narrowly beaten Bangor at Judges Road seven days previously, Derry were confident they had turned a corner following a superb defensive display. However, 80 odd minutes later Seapoint had leapfrogged Derry into sixth on goal difference and left the 2C table looking even more congested. Derry remain on 27 points but now sit just one point ahead of both Bangor and Tullamore on 26 points with Thommond sitting bottom on 18 points. Seapoint have had some excellent performances and, like Derry, their league position demonstrated how competitive this league is. Seapoint were the first on the scoreboard after taking advantage of good field position, far too easy a score from a Derry point of view. Derry were struggling for any continuity in a first half that was constantly disrupted by injuries and referee interventions. Alex McDonnell kicked two successful penalties but Seapoint grabbed a brace of tries, one converted and even played with 14 for ten minutes, managing to end the half leading 12-6. The second half was one way traffic. Barr a late break that finally got Davy Graham into space from just inside his own half to score a late consolation, Derry just could not find any rhythm to their game. In contrast, Seapoint were determined, focused and up for the game, playing like a team that wants desperately to stay a senior club with four tries in the second 40 minutes. The final score didn’t flatter the home side who were well worth the victory. Derry didn’t do enough and disappointing as the result was, it was the performance which will have given Head Coach Paul O’Kane most cause for concern. Derry were second best on the day by some distance. 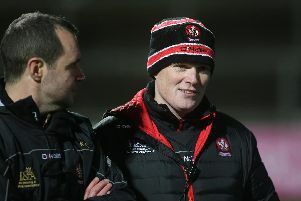 The result leaves Derry with a massive, April 6th game against Limerick side Bruff, who currently sit third, the first of two games which will decide Derry’s AIL future. Despite the disappointment for the First XV, it’s far from ‘doom and gloom’ at Judges Road with the Senior women due to take on Malone at Kingspan Stadium on April 13th in the Junior Cup Final, the Seconds securing promotion with a massive 74-12 win against Belfast Harlequins and the Thirds XV defeating Cookstown 41-12 to book a place in the Butler Shield Final against Coleraine. 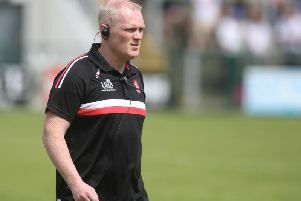 Derry remain in charge of their own destiny but need to defeat Bruff for that to remain the case ahead of a huge encounter away to relegation rivals Tullamore on the final day of the season.